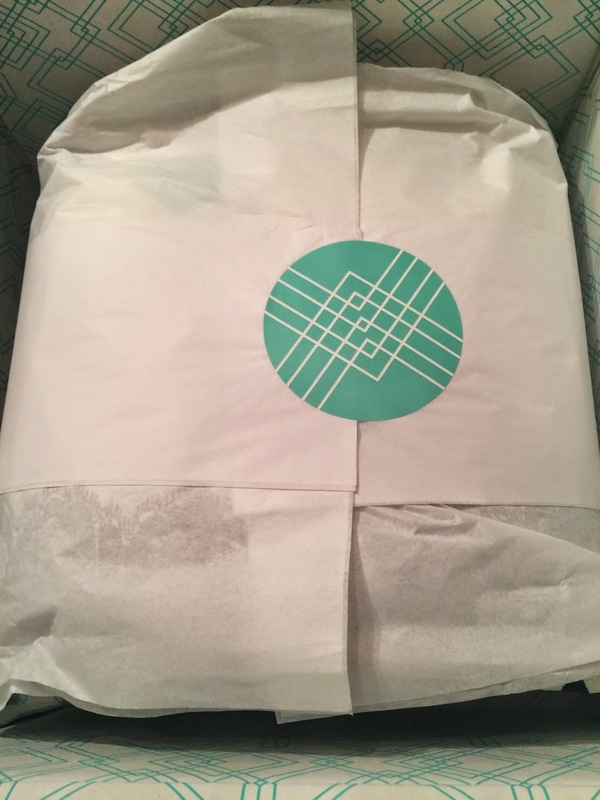 I haven't tried Stitch Fix lately, so I decided to try it again. 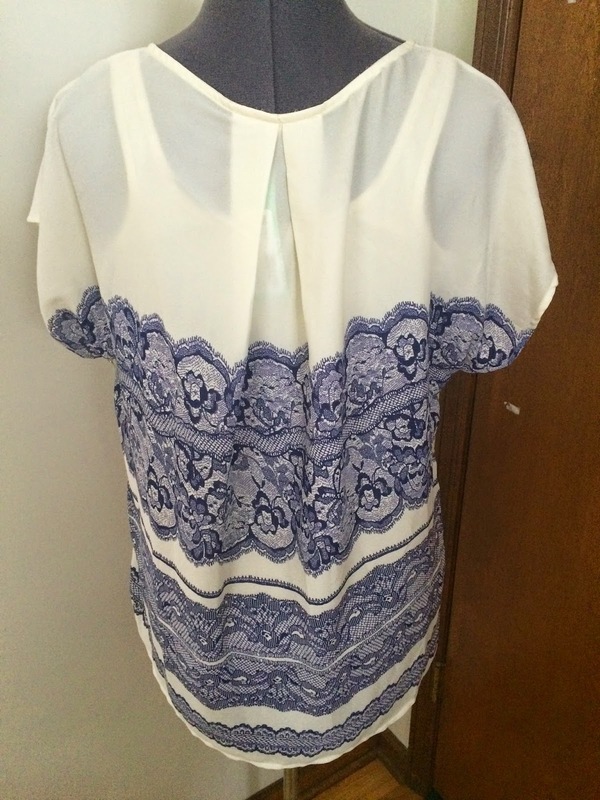 I have received four orders before this, so this was my 5th Stitch Fix. I had stopped getting Stitch Fix every month, because I thought it was pricey and I wasn't get many pieces I was in love with and could justify paying full retail price for. So, let's see what I thought of this fix. Here is a first look. I do really like their color scheme and simple packaging. I had to take pictures quickly to return it within the time frame (you have 3 days to return the items you don't want). So, I used my dress form for the pictures instead of styling all the clothes. I will explain the fit, but unfortunately I don't have the clothes styled on myself this time. Your stylist sends a note of why they chose the items for you and styling tips. You also can include items you would like to receive in your fix in your profile. I requested a specific cobalt skirt, but unfortunately they were out of stock, so they were unable to include it in my fix. But, they did notice a shirt I pinned to my Pinterest page that I linked to my account, so they sent that! 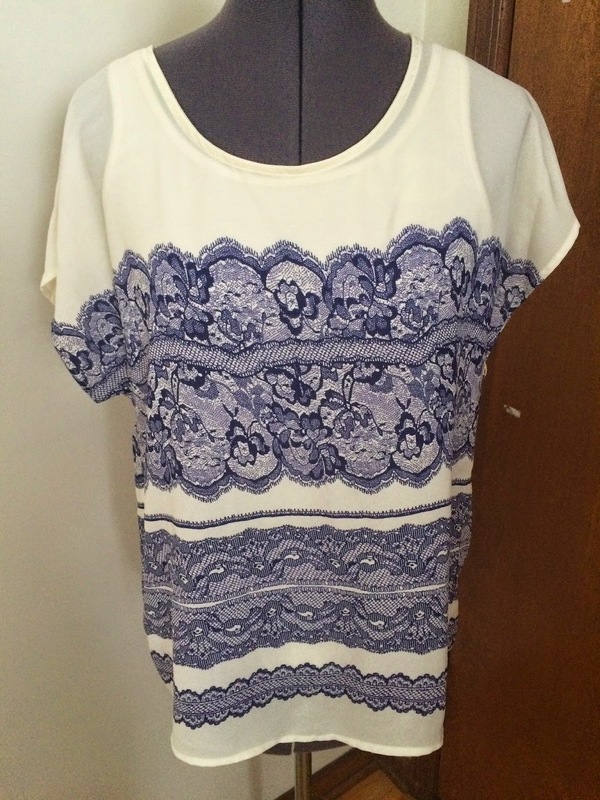 The shirt I had pinned to my Pinterest page that I saw a few other people receive was a 41 Hawthorne Milan Lace Print Back Pleat Top. The retail price is $58. I liked this shirt, but it fit me quite large and was not flattering. I also wasn't crazy about the ivory color on my very pale skin. Plus the lace look was just a print and not actual lace. And I thought it was quite pricey, so back it went. 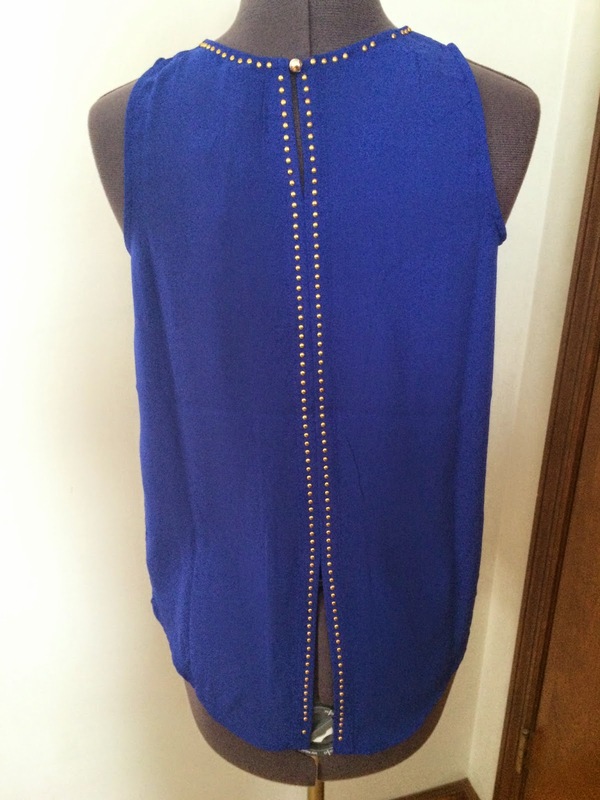 The next item I received was a Renee C Edmondo Stud Detailed Split-Back Blouse. The retail price is $48. I would have liked this, but quite a few studs were missing when I took this out of the box. 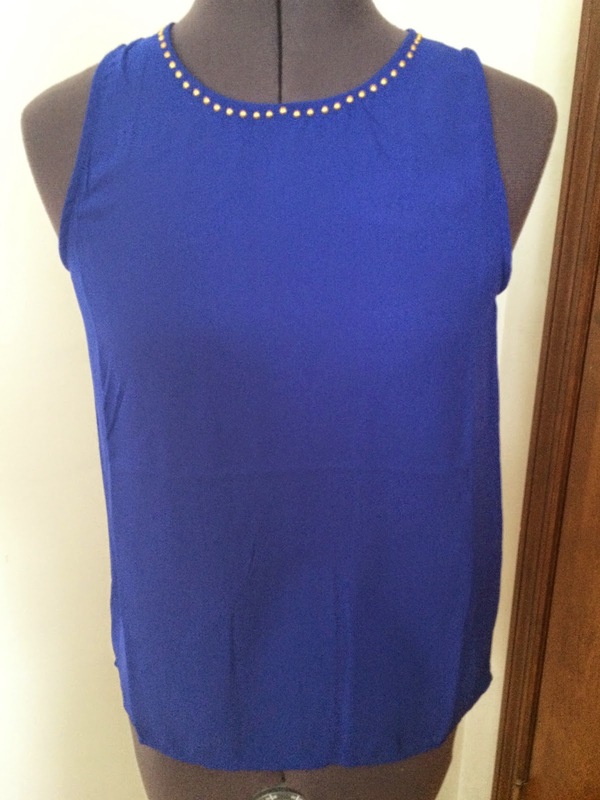 I love the cobalt color and have been requesting cobalt blue items every time I order a fix. This fit nicely and I liked the back detail. But I wasn't going to pay retail price for a shirt that was not in perfect condition, so back it went. 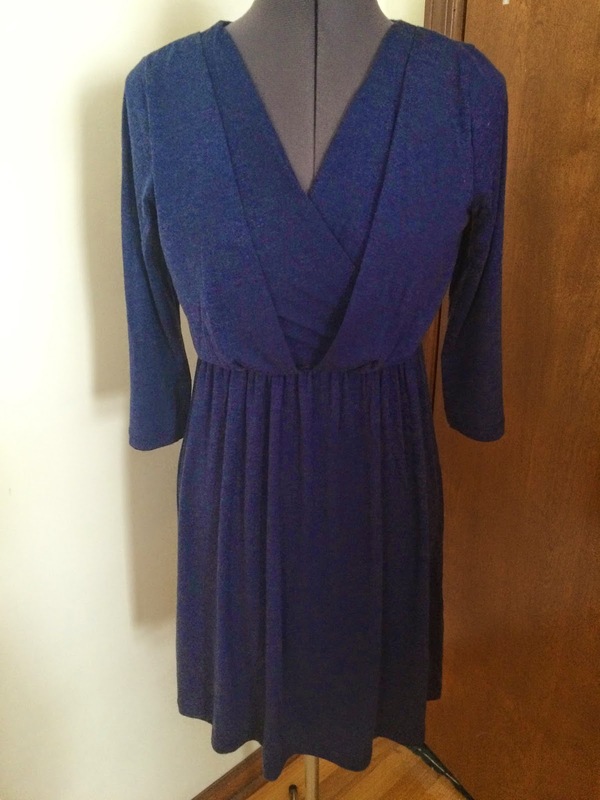 I also received a Gilli Nicilio 3/4 Sleeve Faux Wrap Dress in navy. The retail price is $68. My first thought was it was quite pricey for a jersey dress, but this felt so soft and comfortable on, plus I loved the detail on the top. I could definitely style this for a day at the office or out for the night. And it was a classic navy color that I could wear every season and for years. And it fit perfectly and my two year old called me a princess and grabbed my hands to twirl around with me. So, this became a keeper! The next item I received was a Renee C Marcy Skirt. The retail price is $58. 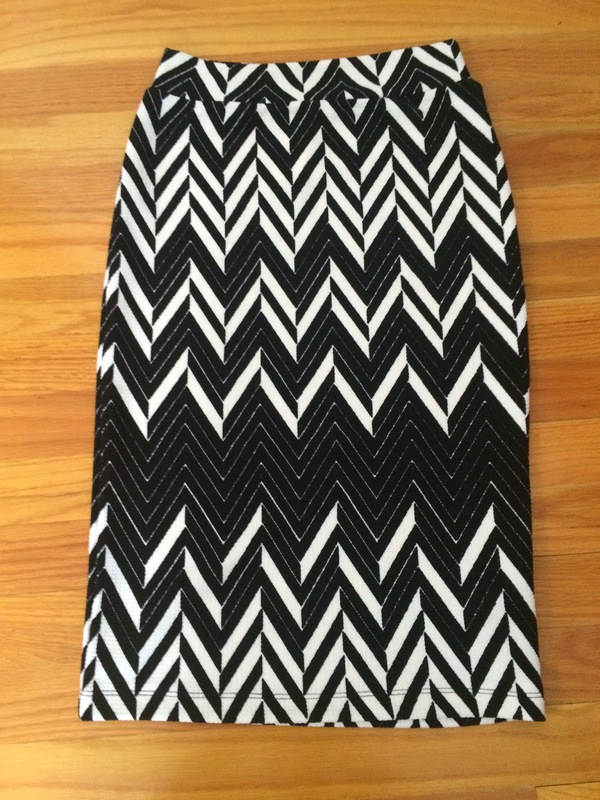 This had a great chevron black/white print that I loved. I wanted this to fit, but it was very form fitting and walking or sitting made it wiggle up, so this wouldn't have worked for me. I would have been constantly pulling it down to get it to lay properly. It also was too tight for the dress form, so I had to take a picture of it laying flat. So, as much as I wanted this to work, back it went. 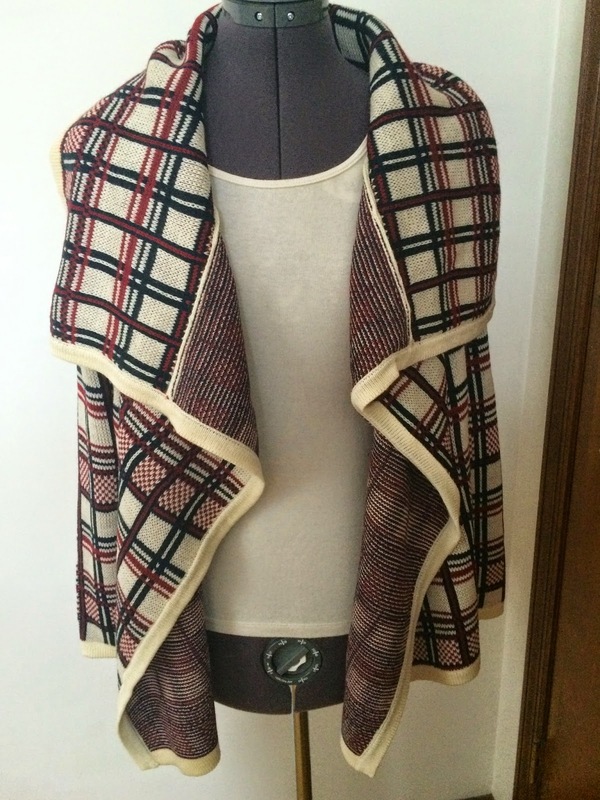 The final item I received was a Moon Collection Alma Plaid Drape Front Cardigan. The retail price is $74. I knew I wouldn't like this. I wasn't crazy about the color, pattern, or shape. I love cardigans, but more structured ones that I can wear to the office. This just looked frumpy on me. The stylist suggested I wear this with the navy wrap dress pictured above. And I tried it, but this cardigan was very overwhelming on my small frame, and did nothing for my shape. So, this went back. My thoughts on Stitch Fix have not changed much. It always makes me feel like I need to purchase at least one thing, so I don't lose my $20 styling fee. But the items are overpriced in my opinion and I can't help but compare it to Golden Tote prices, which I am much more pleased with. And they carry a lot of similar brands. So, I kept one dress from my fix, that I do love! I told myself I will only pay full retail price for items I truly love and can work into my wardrobe easily and know I will wear often. I'll be holding off awhile before getting another fix.